Restore Quick Launch Toolbar !! Many Windows users have grown accustomed to using the quick launch bar to quickly start applications and access folders. The new taskbar is kind of like a quick launch bar on steroids but there are some things it can’t do. For example, a folder or a drive shortcut can’t be pinned directly on the new taskbar. Instead it places the shortcut into the Explorer folder organizer. For some that is fine but many quick launch geeks want the icons directly on the taskbar. Thankfully, there is a way to bring back the quick launch toolbar. First, right click on the taskbar and select Toolbars and then New Toolbar. 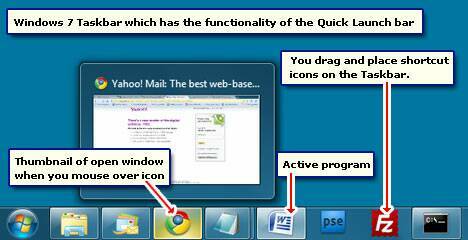 The quick launch toolbar will now be displayed but you will need to move it to the correct location on the taskbar. Just click on the Quick Launch label and drag it all the way to the left. After you adjusted the width of the quick launch bar the last step is to remove the Quick Launch label. Right click on the text and click on Show Title to remove the option. Tada!! You have now restored the classic Windows Quick Launch toolbar.